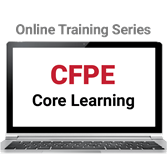 Prep for success as a fire plan examiner with NFPA®'s practical online training series addressing must-know requirements in NFPA 13, NFPA 72®, and NFPA 101®. Proficiency as a fire plan examiner demands a solid understanding of core concepts in widely adopted editions of NFPA 13: Installation of Sprinkler Systems, NFPA 72: National Fire Alarm and Signaling Code®, and NFPA 101: Life Safety Code®. NFPA® provides the training you need -- online in your own time frame -- with this essential series. Working at your own pace, these courses provide essential information every fire examiner needs to know, and deliver the type of critical knowledge needed for success in the NFPA Certified Fire Plan Examiner (CFPE) program. Anyone with the roles and responsibilities of fire plan examiner: fire service professionals, code officials, AHJs, insurance professionals, and others expected to maintain this certification as part of their employment requirements.